Leanne Pooley has been a documentary filmmaker for over 25 years and has directed films all over the world. In 2011 Leanne’s work was recognised by the New Zealand Arts Foundation and she was made a New Zealand Arts Laureate. Leanne was named an “Officer of the New Zealand Order of Merit” for Services to Documentary Filmmaking in the 2017 New Year’s Honours List and she is a member of The Academy of Motion Picture Arts and Sciences. See Awards and Honours. Born in Canada, Leanne immigrated to New Zealand in the mid- 1980’s and began working for TVNZ. In 1992 she moved to England where she made documentaries for Britain’s major broadcasters including the BBC, ITV, Channel 4 as well as PBS and Discovery in America. Pooley’s documentaries have screened in more than 100 countries, and include topics ranging from rugby to the Pope. See Filmography . Upon her return to New Zealand in 1997, Pooley established the independent production company Spacific Films. Leanne’s most recent work is the animated feature 25 APRIL. This innovative documentary uses animation to tell the story of the ill fated WWI Gallipoli campaign. 25 APRIL premiered at the 2015 Toronto International Film Festival and was one of just nine films in competition at the Annecy International Animation Film Festival (the world’s premiere animation festival). 25 April is the first New Zealand animated feature to qualify for Academy Award consideration and was on the 2017 Oscar’s long-list. In 2013 Pooley directed the 3D feature film BEYOND THE EDGE for the General Film Corporation. This film tells the story of Edmund Hillary’s conquest of Everest. It premiered at the Toronto International Film Festival and was a runner-up for the People’s Choice Award for Documentary. Leanne received the “Best Director-Documentary” award at the New Zealand Film Awards for her work on BEYOND THE EDGE. In 2009 Leanne’s film TOPP TWINS – UNTOUCHABLE GIRLS about the lives of lesbian, singing, twin sister comedy duo, the Topp Twins won 21 International Awards including “Audience Awards” at the Toronto International Film Festival, the Melbourne International Film Festival, and the Gothenburg International Film Festival among others. It has won jury awards at the Seattle Film Festival, New Doc New York, The Nashville Film Festival and the Florida Film Festival among others. It also won “Best Feature” at the NZ Film & TV Awards, and reached over $2 million at the box office making it the most successful New Zealand documentary of all time. Previous documentaries include SHACKLETON’S CAPTAIN a feature length dramatised documentary about Frank Worsley. Captain of Sir Ernest Shackleton’s Endurance which was crushed by pack-ice off the coast of Antarctica in 1915. 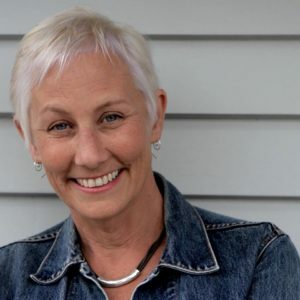 The documentary feature THE PROMISE, about euthanasia campaigner Lesley Martin which won the 2006 New Zealand Screen Award for “Best Documentary” and HAUNTING DOUGLAS about choreographer Douglas Wright. HAUNTING DOUGLAS was Leanne’s first feature length documentary. Haunting Douglas earned her the award for “Best Director” at the 2005 New Zealand Screen Awards. The film also won “Best Documentary” at the International Reel Dance Awards. For a full list of Leanne’s Directing/Producing Credits go to Filmography . Leanne has served as a judge for the International Emmy Awards, is a voting member of the Documentary Branch of the Academy of Motion Picture Arts and Sciences, has extensive teaching experience and has published several articles on documentary filmmaking. Leanne Pooley lives in Auckland with her husband and two daughters. More information about Leanne on Wikipedia.